Fine art inspires awe, design changes behavior. So, just how much of graphic design is fine art? We've all seen the comparisons, but I'm going to attempt to get this comparison down to its essence. To simplify things, I'll ask three questions: 1) why do artists do what they do? 2) where does the inspiration come from? and 3) what is the purpose of the finished work? Of course, I think the illustrations say it all. 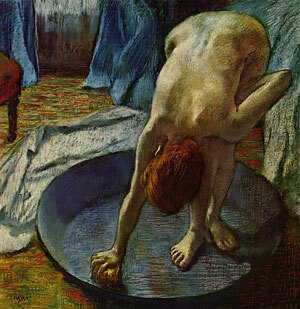 Pure art, as in this famous Degas painting, The Tub, inspires awe simply because it's beautiful. Why? Fine artists have to create. Their motivation comes from within. It's part of who they are, their identity. They have to paint, sculpt, write, act, photograph or they just might go crazy. Where? Their inspiration comes from within. No one has to tell them (sure they might get some big juicy commission, which adds to the inspiration). That said, it can come from what has always inspired artists: the beauty in nature, e.g., a scene, a face, a color, a shape, or another work of art. What? Here I tread on uneasy ground, but hear me out. But first, more questions. Does anyone, other than the artist, really need to see it, experience it? Or is the very act of creating it satisfy the original need? My opinion, no audience is needed. Secondly, does the audience have to like it? My opinion—no, they don't. Sure, the artist may be hurt or feel like they have failed (or out the commission), but because it's done for himself, it doesn't matter one way or the other. To make a point, this Degas can now be used to change behavior, though art aficionados might be offended. Admittedly, I recognize designers are artists and we have many of the same characteristics, and that we were probably artists to begin with, but instead of painting, for example, or outlet for expression is graphic design. Why? Our chief motivation comes from other party asking us to create something for them. If you are doing it of your own will, you probably are just being an artist. Where? Our inspiration comes from 1) our desire to serve and please the person asking, 2) our dedication to solve their stated problem, and 3) the process of executing the solution, supported by our exploration, research, and creativity. Notice, I didn't say anything about money. What? Now we come to the whole point of this discussion—the success or failure of the end result. Design must change behavior to be successful. The reader or viewer, as a result of experiencing our work, must buy, sign up, attend, donate, be moved, be inspired, learn, or somehow do something they might not have done, even if it's just to notice and acknowledge it's existence. The bottom line? It's the bottom line. Our clients come to us because they want someone to do something that will somehow further their purpose, not ours, by creating a change in the behavior of those in their audience, their customers, or their clients. So, whether it's a logo, a business card, a brochure, an ad, a sign, an exhibit, or a Web site, as designers we apply our art and the fundamentals of design to type, line, image, color, space, and grid to create and send a message, no matter how subtle, that will change the will of those who see it.